On the Saturday night of this year’s Gateshead International Jazz Festival was the performance by The Spring Quartet; a concert that was regarded by many to be the headline attraction of the weekend. 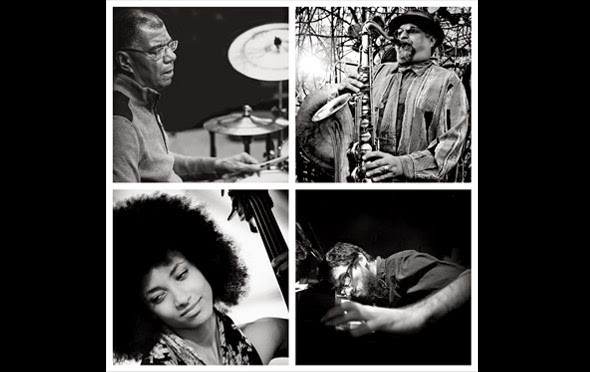 This ensemble is something of a supergroup, featuring the stellar line-up of Joe Lovano, Esperanza Spalding and Leo Genovese under the leadership of the legendary Jack DeJohnette, and their photographs could be seen on posters, leaflets and programmes throughout the festival, further increasing the hype and excitement gathering around this performance. However, first to take to the stage were two young musicians who are swiftly gathering reputations that are making them serious names on the European jazz circuit. Since the release of their album Neck Of The Woods in 2011, tuba player Daniel Herskedal and saxophonist Marius Neset have stripped the music from their duo repertoire down to its purest form. Where their record featured singers and multi-layered saxophones and early live shows saw Herskedal using loop pedals, at their Gateshead performance no such effects were used and what the audience was presented with was two very talented musicians and their instruments. The set opened with some ethereal, lamenting soprano playing from Neset before Herskedal added a rumbling, ominous drone. As the melody unfolded Herskedal revealed a technique of singing or humming whilst producing a different pitch on his instrument, adding some unexpectedly rich and resonant harmonies to the performance. The tuba is rarely thought of as a particularly versatile instrument, but in these capable hands it showed its true colours. Herskedal’s range on the instrument was incredible as he produced thunderous, booming notes and also had a pure, resonant sound at the top of his register. He played floating melodies one minute, provided fuge-like basslines the next and even added an array of percussive sounds to the music. This, coupled with Marius Neset’s reputation for lightning fast displays of his ferocious technique, could have left this set as an emotionless display of instrumental facility, but this was far from the truth. For the majority of the set, both musicians used their skills only to serve the music. Their tender reading of Abdullah Ibrahim’s ‘The Wedding’ was a particularly beautiful moment, as was the duo’s original composition ‘Good Morning Denmark’. This was preceded by an astounding tenor solo from Neset which was hugely impressive and showed his outstanding control of melody, rhythm and his instrument but the transition from this high energy display into such an understated, simple piece felt slightly forced. I thoroughly enjoyed this opening set which showed two young musicians playing earnest music with absolute competence and creativity. A review I had read of one of The Spring Quartet’s shows in the U.S. painted a picture of a band whose music was sparse and introspective (I believe the word ‘woolly’ was used), but this was far from the case at their Gateshead appearance. The quartet ambled onto the stage with no sense of urgency at all but as soon as the music began their energy hit the audience. The group burst into a lively rubato melody, Lovano’s huge sound filling the hall and cutting clearly through DeJohnette’s maelstrom of drums. After a brief repeated riff in 7/4 the ensemble settled into a loping swing and Lovano showed his form, taking a powerful solo that took no reservations that this was just the beginning of a long set. The fluidity of his stream of ideas was truly inspiring and he built to an incredible intensity, fuelled by the aggressive playing of the other three members. Equally fiery solos followed from Genovese and DeJohnette, the 71 year old drummer playing with athleticism beyond his years. This was followed by a brief unaccompanied bass solo which was a moment of calm after, and as it turned out also before, the storm. Spalding’s measured, considered playing blended fragmented, angular phrases with the earthiness of the blues and led smoothly into the rhythmic head of DeJohnette’s composition ‘Herbie’s Hand Cocked’. More intense, uncompromising improvisations followed, with Lovano channelling mid-sixties Coltrane supported by Genovese's energetic and dissonant comping before the pianist stretched out on a long, high energy solo blending melodic passages with wild free-jazz scrambles across the keyboard, pursued by DeJohnette’s increasingly polyrhythmic drumming. There were some welcome changes in texture in the middle portion of the set. One tune featured Spalding’s enchanting voice in an atmospheric, acapella, wordless improvisation before beginning a call and response dialogue with the band, and we also saw both Spalding and Genovese switch to saxophones to join Lovano in a free improvisation against the backdrop of Dejohnette’s drums. This raucous yet celebratory playing eventually formed into a brief Ornette Coleman-esque melody before crashing to a sudden stop. The songs were punctuated with DeJohnette’s bizarre and seemingly unhinged introductions of the tunes and musicians. If this was his off the wall sense of humour, I felt that it rather missed the mark. I’m afraid to say the only musician I can seriously fault in this set is also DeJohnette. I felt that he was over-playing from the start with what initially seemed like an admirable flare soon becoming brash and intrusive, as he consistently played crashing fills and sudden hits at unexpected, to my ears inappropriate, moments during other people’s solos. Being collaborative and engaging with the other musicians on the bandstand is obviously encouraged, but imposing yourself upon another musician’s solo is perhaps not. The second half of the set adhered less to the typical jazz structure of ‘head-solos-head’ and took on a far freer and more collective feel, as expansive and at times highly creative group improvisations pushed the set in new directions. These explorations also pushed the audience it seems, as they grew increasingly restless and delivered sparser and sparser applause. In all fairness, this was challenging music; dissonant, with lengthy free form improvisations and a sheer intensity that was, at times, draining. Also, like all supergroups, The Spring Quartet had an awful amount of hype to live up to. This combination of high expectations and serious, boundary pushing music is almost certain to upset some percentage of an audience. Overall, despite enjoying much of the concert and admiring the ethos and vision of the group as well as their enormous technical and improvisatory talents that were apparent throughout the set, I found the performance somehow unsatisfying. There were too many great moments for me to be truly disappointed with The Spring Quartet, but I did not feel emotionally connected to the majority of their music in any way beyond its intensity, perhaps due to a lack of sophistication on my part. Either way, although I was in no way as disappointed as many of the audience members I heard mumbling on the way out of the auditorium, this concert did leave me a little cold.